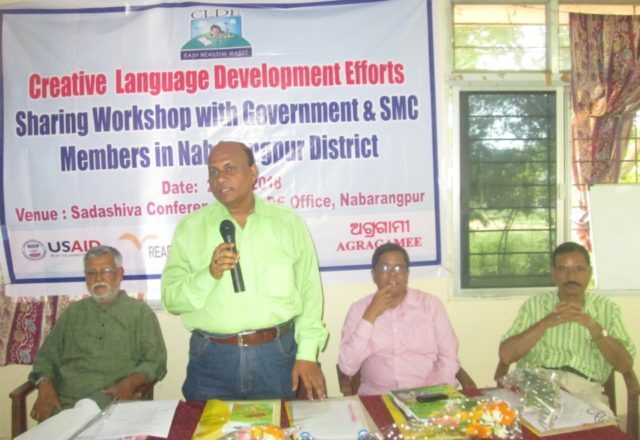 Nawarangpur: Agragamee, Kashipur in collaboration with District Education Office, Nawarangpur organize a District Level Sharing workshop on Reading & Language Development in Tribal Areas. Mr. Chandasekhar Panigrahi, DEO, Nawarangpur, Dr. Abhiram Biswal, Colomist, Reader in Model Degree College, Nawarangpur, Dr. Bijaya Mishra, Dr. R.N. Behera, Mr. Bulu Hota, Mr. Dillip Hota, Block Education Officers of Nawarangpur, Add. BEOs, Lecturer of Nawarangpur College, SMC members, academicians, columnist, representatives from NGOs, representative of Media house , teachers participated in the workshop. Mr. Achyut Das, Director, Agragamee shared that Agragamee has working in the development of Education in Tribal Area. since last 2 years Agraamee has working with 18 primary schools of Koraput, Nawarangpur and Rayagada district to develop of Reading and Language development of early grade primary student of underpriviledged community. He also share that the result has quite good and the children performing well. Agragamee wish to share the success of the method so that teachers, education department may be adapt the same. Mrs. Vidhya Das, Joint Director, and Coordinator of this project shared about the project, its objective, strategies, , approach . The teachers known as Siksha Sathies demo about their teaching and share experience during the involve with this programme. Mr. Chandrasekhar Panigrahi, DEO, Nawarangpur, attending as chief guest share that despite several steps taken by government, the result in primary education is not satisfactory.. He call that there is need to be working together among the Teachers, Community and Students to enhance the literacy and quality education of Nawarangpur. Mr. Panigrahi call for working in a common platform among govt and non. 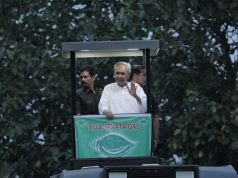 Government organization to scale up the innovation work of education in a larger scale to other backward block. During the technical sessions, Whole Language Approach to Reading and Language Development, Games and Play way Approach in Language Development, Role of SMC Members, and how Village School an be improved discussed. The Teachers ( Sikshasathis) of Agragamee programme demo their practices during the meeting. Followed by a discussion and observation by the participants and guest. 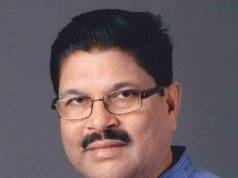 Dr. R.K. Behera, Retd. Principal, Nawarangpur Collage, Dr. B.N.Biswal, Lecture, Nawarangpur Collage, Dr. Ghasiram Behera, Lect. In English, Nawarangpur Collage, Mrs. Basanti Mohanty, noted writer, Lecture, Dabugaon Collage, Mr. Bulu Hota, Member, Odisha Sahitya Academy, Mr. Dillip Hota, Mrs. Kanakamani Das, Mr. Chitaranjan Panigradhi, Mr. Jahangir Mahammad also and others share their views on this occasion.